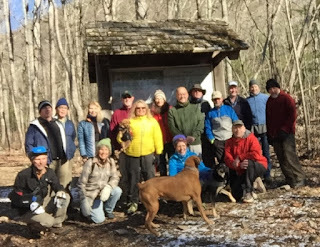 A sizeable group of 20 hikers gathered at Panorama parking just south of Thornton Gap on a fine winter morning, chilly but clear with no wind. Hike leader Barbara Martin was blessed with many fine hike leaders joining her for the hike: Jayne Mayne, Mark Trail, Michael Seth, Claire Cline, Pete Fink, Kelly O’Rourke, Bill Holman and Iva Gillet. We were also joined by Taylor Putney, Kim Butcher, Bev Fink, David Crowe, C J Woodburn, Brian Muszynski, Charles Staples, Lorna Werntz, Susanna Williams and Brenda Browning. Mark Trail organized the car shuttle, splitting us into 2 groups with four drivers shuttling cars back to our end point at Panorama parking lot. Mark, his son Mark Jr., visiting from Alabama, Bill Holman and David Crowe kindly volunteered to drive the cars and hike to meet us, then hike back. The rest of us started hiking north from Stony Man parking area. We had incredible views at numerous points and stopped to have lunch at Pinnacles picnic area. Two people not in our group had started a fire in the picnic shelter fireplace where we could warm our hands. Barbara’s home-made oatmeal, cranberry, chocolate chip cookies were a big hit. 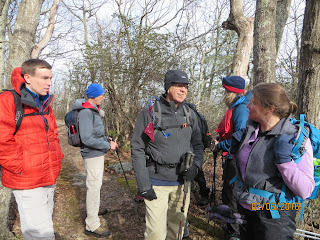 We left the picnic area and headed for the Pinnacle and onto Mary’s Rock, splitting into two groups. Both areas were beautiful and Mary’s Rock was especially enjoyable with the crystal clear skies and no wind. 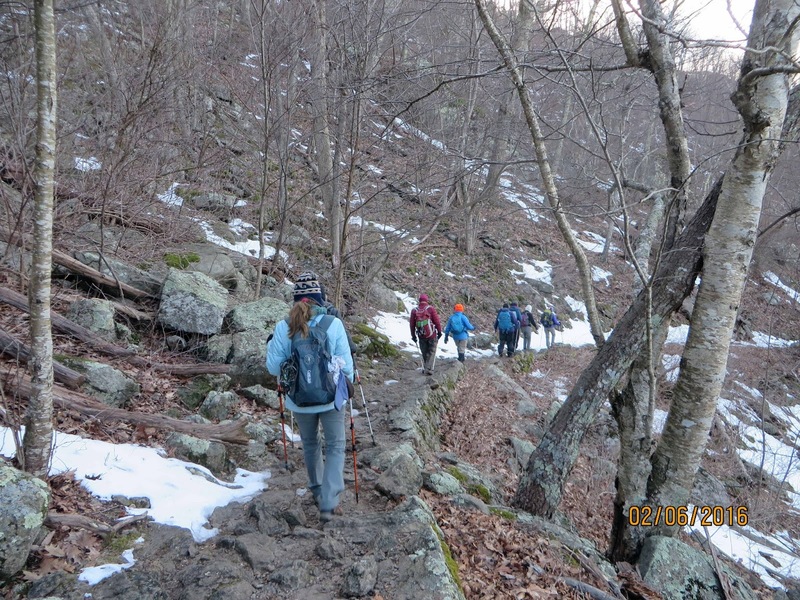 The 1.7 mile descent to Panorama parking was a challenge with ice covering parts of the trail. One of our party slipped and fell, hurting her leg. The hero of the day was Brian Muszynski, who carried her over a half mile on his back on the icy trail to the parking lot, where Shenandoah National Park rangers met us and assessed her condition. Susanna Williams and Brian then drove her to the hospital in Luray. Thanks everyone for their help and great team work in handling this emergency. Thanks also to Claire Cline for the wonderful photos and Taylor Putney for supplying us with the statistics for our hike. 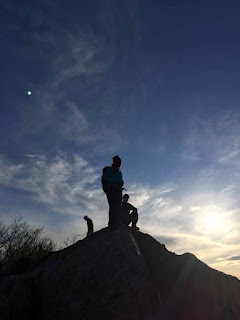 Having a hiking challenge is always fun and inspiring and the Dirty Dozen Wilderness Hike Challenge certainly fit the bill. 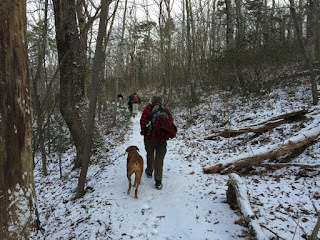 The Challenge, sponsored by the Southern Appalachian Office of the Wilderness Society and Blue Ridge Outdoors Magazine, was to hike 10 miles in 12 different wilderness areas in the Southeast United States from September 1, 2014 through September 30, 2015. The Challenge marked the 50th anniversary of the Wilderness Act, which established the Wilderness Preservation System and set aside an initial 9.1 million acres of wildlands. I took on the Challenge in October, 2014. 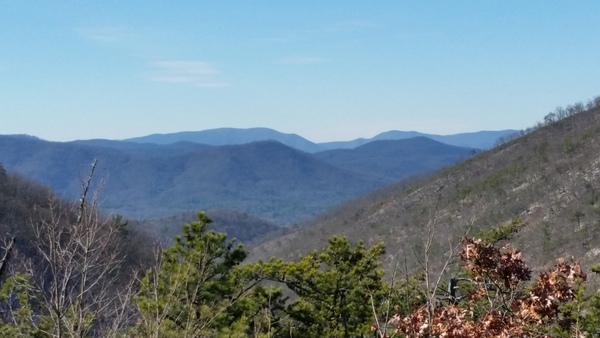 Living in Waynesboro, VA close to Shenandoah National Park, one of the wilderness areas, was an advantage since I’d already completed several 10 mile hikes there. 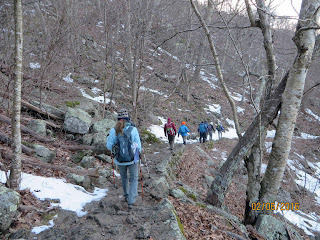 Many PATC members joined me to complete other wilderness hikes: Clai Lange in St. Mary’s and the Priest Wilderness areas, Susanna Williams and Kelly O’Rourke in Ramsey’s Draft Wilderness and Marit Anderson on a backpacking trip (my first) in Dolly Sods Wilderness. 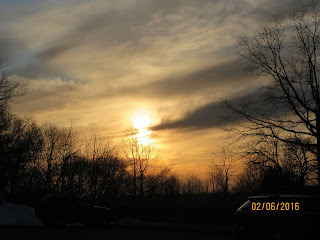 Anne Colgate and I went the distance to complete all 12 hikes. 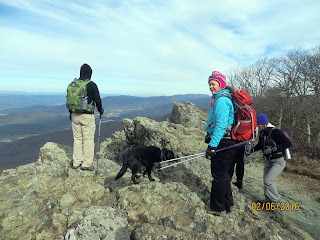 We ticked off wilderness areas close to us fairly quickly: James River Face, Thunder Ridge and Three Ridges. Sometime in August we faced the fact that we had four more wilderness areas to hike and none were close by. After some research and schedule juggling we decided on Rich Hole Wilderness, close to Covington, Virginia. We had little information on Rich Hole and searched for an hour to find the trail head. The first three miles of what we thought would be an easy hike, we encountered 16 stream crossings. Then we found ourselves pushing through 7 feet tall vegetation and brambles, barely able to discern the trail. Finally out of the weeds, so to speak, we walked on a clear trail until we again entered a sea of giant plants with no trail in sight. As we stood in this jungle wondering what to do next Anne said, “I think I hear something.” Having been warned of bears I was busy trying to plot our escape when Anne said, ”I think it’s a person.” We shouted out and waved out hiking poles overhead. A male voice yelled back, “Stay there and I’ll cut my way to you.” Our rescuer was Mark Miller, the maintainer of the trail, field director of the Virginia Wilderness Committee and author of Wild Virginia. Talk about serendipity! After our very “wild” wilderness experience at Rich Hole I sought the advice of the hiker’s encyclopedia, Jeff Monroe, who won first prizes in the Challenge for hiking the most miles and the most wilderness areas. With Jeff’s invaluable information Anne and I decided to complete our Challenge by hiking three wilderness areas in the Roanoke/Blacksburg area: Peter’s Mountain, Brush Mountain East and Mountain Lake. Although Anne and I didn’t win any prizes, we were proud to be among the 38 hikers out of the 565 registered to complete the Challenge. It was an adventure to be remembered! ** Editor's note: this article appears in the February 2016 issue of the PATC newsletter. Due to the snow we decided to play it safe and stay out of the mountains. Walnut Creek is a beautiful local Charlottesville park and voted Charlottesville’s Best Park many years in a row. 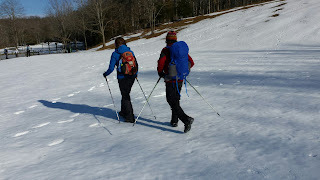 Most of us wore our Yaktracs (or equivalent) and used poles over the 7.2 snowy miles. 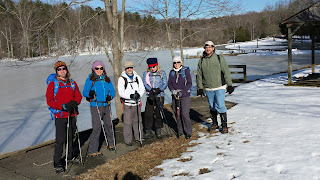 We saw a group from Old Dominion Hiking group over to enjoy the day as well. We hiked the first 5 miles, then sat in the parking lot in the sun and out of the wind to enjoy lunch (and chocolate!) , then hiked the last 2+ for a total of ~ 7.2 miles. Hikers: Dan Ralston, Jeanne Densmore (who found $41.00 on the trail!!! ), Charles Staples, Claire Cline, Susanna Williams and James McAdams. We all had a blast!!! 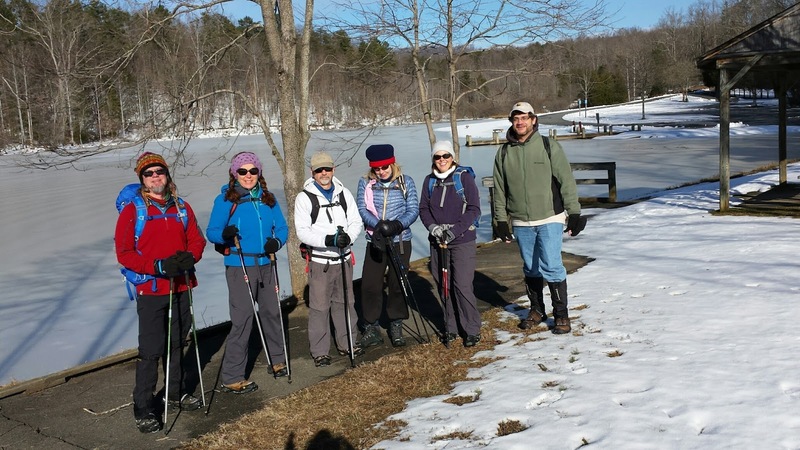 Susanna Williams and Jeff Monroe drove down from Charlottesville and joined 14 Roanoke-based hikers in a midweek hike of the James River Face Wilderness on the eve of the big 2016 snowstorm. And, even though these two hikers commuted together, they did not hike together. The group was large, and due to wilderness regulations, was split into two groups with one hiking the loop clockwise, and the other in the opposite direction. 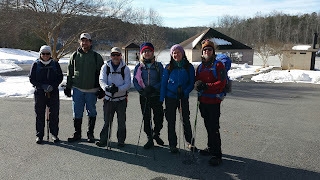 Both groups met for lunch at the site of the former Marble Spring Shelter before continuing on their respective loops. Everyone ended up hiking the Sulphur Springs Trail, the Appalachian Trail, the Sulphur Ridge Trail (no longer on any current trail maps) and the Petite’s Gap Road. All agreed that this is a spectacular hiking loop. Total length: 7.8 miles, with 1368 feet total ascent.